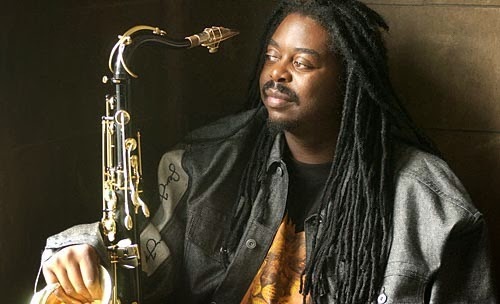 Saxophonist Courtney Pine CBE talked to Alison Bentley about bringing Caribbean-influenced jazz from his latest House of Legends album to Camden’s Jazz Cafe, Feb. 7th and 8th. Alison Bentley: I heard you talk last year about learning on the bandstand with Art Blakey and Elvin Jones. The first time I heard you play was with the Jazz Warriors at the old Bracknell Jazz Festival. Are there still opportunities like that for young jazz musicians to learn on the bandstand? Courtney Pine: That was in the 80s, right? I remember that one really well. I'm about to launch another band called the Venus Warriors, an all-female band. And it's a version of the Jazz Warriors. I'm having to recount the story of this first show all the time. The musicians were scared of doing that gig. I remember that show, cause there was a great trumpet player called Harry Beckett. He didn't really want to do it. He's like, 'I don't really want to be with these young kids.' And I'm like, 'You're not going to have any pressure, we'll play your music.' I just remember going through this whole thing of convincing my elders, that this would be a good idea. And I'm going though it again with these women. AB: You're setting up new opportunities. CP: It's hard, but I've been doing the best I can. The guys who have come through, like Soweto Kinch, Shabaka Hutchings, they're all award winners, so the process does work. In terms of me, I just had to go and find it, I had to go and search. But I'm doing the opposite now, I'm going looking for youngsters who want to play, and even though I've told you because you asked me, I don't actually go out and make a big noise about it. But I think it's such a strong component of our industry that we inspire the young and give them a platform to play. I've a record label that does it now as well. There's a band called Empirical that released their début that won Album of the Year. AB: You produced that one? CP: Yes, I did, but they've had three other records out on another label. They've gone on to bigger and better things, and that's the idea, that the elders give them the opportunity to stand up. AB: Is the emphasis on elders training younger people a part of the Caribbean tradition? CP: I think so, yeah. If you look at Caribbean Music, it's all about communication and functionality. You can't really play grooves or scales or sounds that aren't relevant to your village, your town, your nation. It just doesn't work. You find that the music that comes from the Caribbean is from the essence of the community. That's what I've tried to do over the years. I've done my apprenticeship playing American jazz, playing classical music, using different approaches to become a better musician. When you start to play from the community aspect, you get a different feel, a different sound, a different kind of demarcation. We started this conversation talking about the Jazz Warriors, which is what that band was all about, a community-based band. I was lucky enough to play with Manu Dibango, a Cameroonian saxophonist who's a spokesman in France. He has a political show. He plays great saxophone, and he inspired me. I did a show with him last year, and the reasons why he plays music are what I want to do as well- to inspire others. AB: I was thinking, the Caribbean islands are so close to each other other but their sounds and styles are so different. Is that because the music's associated with individual towns and communities? CP: Very much so. That's made my day you saying that, because a lot of people think that the Caribbean is all Calypso or Bob Marley. It's not. When you think about Cuba and Martinique, and everything in between- there's a lot of variation. And for me what's inspiring is the fact that these Africans have taken their locality and they've developed something. It's like a scientist saying, 'What can I make out of this thing? What can I make out of these instruments? We can make this style!' One of the styles of music is Mento. If you go on YouTube and look at Mento, there's a guy playing what looks like a cheese grater- and it is! It's what they use to grate the coconut. He's scraping it with some piece of metal. And they put some beads in there, cover both ends, and it's like a shaker. That's what I mean about using your environment to make a new style of music that's particularly relevant to your community. AB: Is it a personal thing, going back to your musical roots? CP: Yeah, cause the first album I ever heard was Ska. My parents, when they came over in the 60s, had a one-bedroom apartment in Paddington, and I can remember holding on to the side of the speaker and hearing this music. As I got a bit older I listened to the B-sides- they were instrumental versions, and I found out later that these guys were jazz musicians, doing jazz tunes, jazz sets in a hotel in the night. And then during the day the producer, Coxsone or Duke Reid, would call them to make this music and they would get a chance to play some jazz for the B-sides of these Ska records. They feature some great musicians: there's one still living to this day- Ernest Ranglin, the guitarist. He arranged My Boy Lollipop and he produced it. He's a great musician, a legend, and fortunately he's still alive so we can still appreciate him. He was around during those days, so I was bitten by the bug back then. AB: There’s one track on the album called Kingstonian Swing- is there a connection between swing and Ska and Mento music, would you say? CP: I think so. I've always felt it. But when I started doing my research I realised that a lot of the musicians from the Caribbean actually ended up in New Orleans. There's a guy called Jelly Roll Morton, one of the pioneers of jazz. His mother was from Haiti and he always talked about Haitian music. I've always thought listening to early jazz music that there was something Caribbean in there. And my research justified it. The track Kingstonian Swing actually segues from a tribute to Stephen Lawrence. His mum buried his body in Jamaica. And if you go to Kingston, there's tempo, speed, pace- there's a certain energy that you get in Kingston, and I tried to capture that on this particular track. AB: It's got loads of energy. It really made me want to dance. CP: The whole album made me want to dance. This is the first time I've done a project where I couldn't keep still! Most of my other records were done in the studio. Everything is quite precise- scored and written down. This one- the band just had me on my feet all the time. AB: You've chosen to stick with the soprano on this album- any particular reason? CP: Several. I like to challenge myself. Is it possible to do a whole show on soprano saxophone? It may seem a simple question but in practice it's not that easy. When you play other instruments you get variations of sounds and range. But it kind of reminds me of the Caribbean. When you think of the great cricket teams of the 70s that Viv Richards and Clive Lloyd led, and how they had so little, but they did so much to inspire and dominate the world in cricket. They didn't have a huge County cricket team like England but they were able to inspire the world. That to me is the Caribbean. For the most part there's a term: Third World. If you've been to the Caribbean- I'm not just talking about holidaymakers -if you've lived in the Caribbean for a period of time, you'll find that there's so much there and it really is about people and the community spirit. The way they interface with their surroundings and survive with so little. I find it hard to call it the Third World- I've been to places far worse. But it terms of playing the soprano, I'm choosing the smallest instrument I could find to lead an album. It made sense to me. AB: It has such a clear, powerful, high sound. CP: Yeah, it's like a a female voice. It's a soprano voice, but it's a limited range. My previous album [Europa] was a bass clarinet album which had a 7-octave range. This has a 2 1/2 octave range. It's harder to play, but for me it can cut through, cut above- if you practise, which I need to do! AB: Are there any particular soprano players who've inspired you over the years? CP: In no order at all: Branford Marsalis, Waye Shorter, Grover Washington Jr., Ronnie Laws, Steve Lacy, John Coltrane and the master of it all, Sidney Bechet. The instrument really is a difficult instrument to play and they've found a way to give it a positive voice. AB One particular thing I've heard you say- that you feel your real instrument is the human body? CP: Yeah, I find that before you can make the choice to make a sound on an instrument, you hear the sound in your head. You have a concept of what you want to do with the sound, rhythmically, harmonically, spiritually. It's created in your brain first, and you pick up the nearest thing- a stone, or a block of wood or a piece of metal, it doesn't matter. My favourite musicians are the ones when you go to see them perform, the instrument disappears when they're playing. Like Hugh Masekela or Fela [Kuti]- it's not really about the technical expertise. For some reason the instrument stops being what it looks like. The saxophone stops sounding like a saxophone, but sounds like a human voice. AB: Your own music always sounds really uncompromising but you always manage to take the audience with you. How do you manage to do both those things? CP: It's an interesting thing. I remember the first time I played at the Royal Festival Hall and gave a shout to the guys on the back bench. And a critic actually said I shouldn't have done that. Basically I used to be on that back bench. I was there with the cheap tickets, so I know what it's like. My hero Sonny Rollins- I couldn't afford to see him play for years. I know what it's like to go to a concert and to be squeezed up at the back. I'm not an artist who looks for the VIP lounge. When I'm onstage I know what it's like. I know when you're yawning; I know what's going on. So I've found ways of keeping myself excited in music and then trying to translate it to the bandstand. In the 80s I was doing what I call an apprenticeship, and I was playing American Jazz Standards. You play these songs and people say, 'Oh, he's not bad. But he's not as good as Charlie Parker.' I noticed every tune had a bass solo and people were yawning! I was yawning as well. And I'd go back to the hotel room and I'd be listening to some Goldie. I thought, 'There's something wrong here, I've got to make an adjustment.' So I started doing more of the music that I was listening to when I went to parties. CP: Yeah. The kind of music- if you go to a late night club- those kinds of sounds. And that might be as simple as incorporating a drum pattern or a bass line, or a song- a Bob Marley piece. And I noticed that would make the audience's eyes sparkle. I guess I've been on that path since. There's no point in going on stage and still doing an apprenticeship, or playing background music. People have paid a lot of money to see you perform- you have to give them something. So my remit is to do something I haven't done before. Alison Bentley: The gigs at the Jazz Cafe- what can we expect? Courtney Pine: We're into the second year of doing the House of Legends project, and I was surprised because I didn't think it would be received so well. The project makes me smile every time I get on the bandstand. It's everything about me and my culture. It's different every night, and I just love playing this music. There are some stiff-upper-lip kind of venues that I have done and I'm looking forward to presenting this music at the Jazz Cafe. It's an open space and Camden Town is very cosmopolitan. I'm expecting a really good time. As a Londoner I know what Camden is like, and this music is ideal for it. It is Caribbean-based, but it is more than that- it is jazz.